Demand for 40G and 100G transport links is growing quickly in recent years. Cloud computing, mobile broadband and IPTV are all driving user bandwidth. 40G links have been deployed for several years. Now, 40G transceivers are ubiquitous in modern data center. In recent two years, the optical industry buzz is all about “beyond 100G” bit rates. And the market for 100G data center optics such as client-side 100G optical transceiver is accelerating. At present, there are several types of 100G optical transceivers launched to the market including CXP, CFP, CFP2, CFP4, QSFP28. Here will introduce and compare them in details. CXP is a kind of hot-pluggable 100G optical transceiver with data rate up to 12 × 10 Gbps. What does CXP mean? “C” represents for 12 in hex, and the Roman number “X” means that each channel has a transmission rate of 10 Gbps. “P” refers to pluggable that supports the hot swap. CXP is targeted at the clustering and high-speed computing markets and is the complement to CFP for Ethernet. Technically, the 100G CXP transceiver works with multimode fiber for short-reach applications, but it is not really optimized in size for the multimode fiber market, most notably because the multimode fiber market requires high faceplate density. 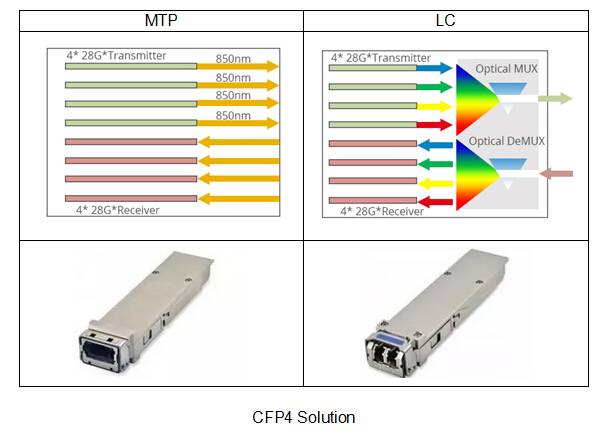 CXP transceiver is 45 mm in length and 27 mm in width, making it slightly larger than an XFP or 1/4 size of a CFP transceiver. It provides higher density network interfaces. 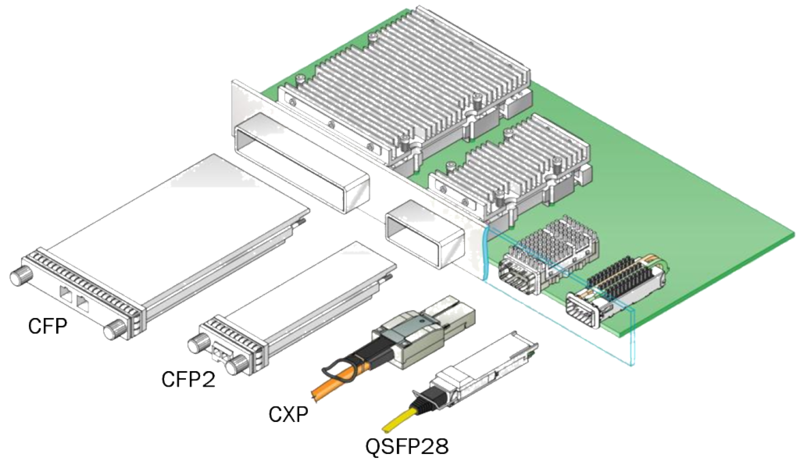 It is a copper connector system specified by the InfiniBand Trade Association. It provides twelve 10 Gbps links suitable for 100 GbE, three 40 GbE Channels, or twelve 10 Gigabit Ethernet Channels or a single Infiniband 12× QDR link. 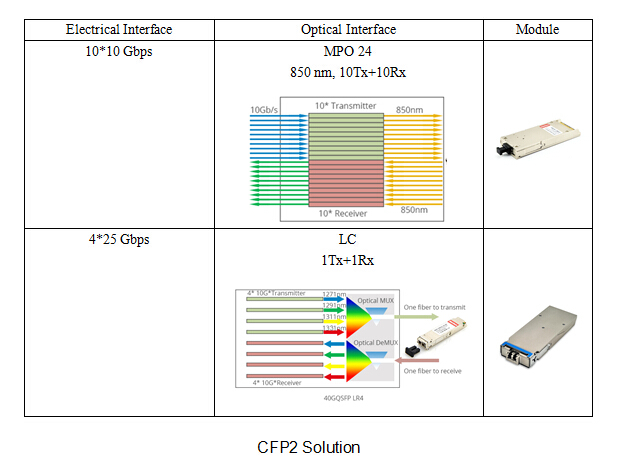 The CFP Multi-Source Agreement (MSA) defines hot-pluggable optical transceiver form factors to enable 40G and 100G applications, including next-generation High Speed Ethernet (40GbE and 100GbE). 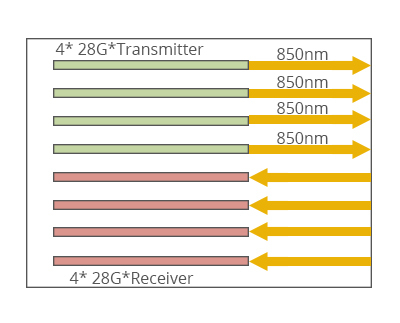 CFP transceiver supports both single-mode and multi-mode fiber and a variety of data rates, protocols, and link lengths, including all the physical media-dependent (PMD) interfaces encompassed in the IEEE 802.3ba standard. There are three PMDs for 100 GbE: 100GBASE-SR10 for 100 m, 100GBASE-LR4 for 10 km, and 100GBASE-ER4 for 40 km. CFP was designed after the Small Form-factor Pluggable transceiver (SFP) interface, but is significantly larger to support 100Gbps. The electrical connection of a CFP uses 10 x 10Gbps lanes in each direction (RX, TX). The optical connection can support both 10 x 10Gbps and 4 x 25Gbps variants. CFP transceivers can support a single 100Gbps signal like 100GE or OTU4 or one or more 40Gbps signals like 40GE, OTU3, or STM-256/OC-768. Similarly, as a small size 100G optical transceiver for high-density applications, QSFP28 also attracts increasing attention. 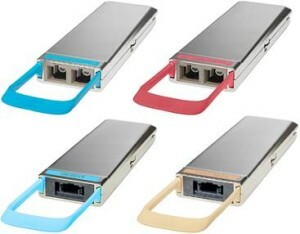 As its name suggests, QSFP28 have the same design concept, namely form factor as QSFP. 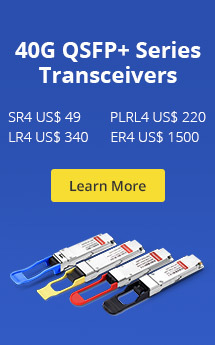 The first-generation QSFP transceivers are equipped with four Tx and Rx and each channel has a rate of 10 Gbps. 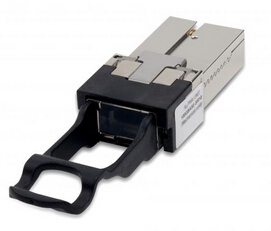 But for QSFP28 transceiver, each channel of QSFP can transmit and receive data up to 28 Gbps. 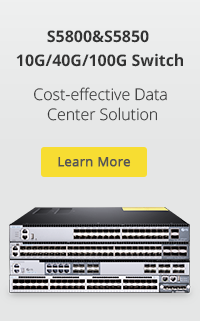 It is new for 100G applications. Compared with CFP4, QSFP28 is just slightly smaller than CFP4. QSFP28 seems to have the density advantage over CFP4, but CFP4’s higher maximum power consumption gives it the advantage on longer reach optical distances. There is another 100G optical transceiver called CPAK in the market. CPAK transceiver is newcomer to this year’s demonstration. This is a proprietary form factor from Cisco but the interfaces demonstrated are IEEE standards and will interoperate with the same interfaces supported by other form-factors. Cisco believes that their CPAK is a good solution for 100G applications. There is a richness of choice of 100G modules. In addition, 100G AOC (Active Optical Cable) assemblies are also launched to the market for short interconnection and 100G migration. Next year is going to be huge for 100 GbE. Meanwhile, with the rapid progress of technology, the 100G optics will become more cost-effective, 100G is no longer far away from us. This entry was posted in 100G QSFP28/CFP/CXP, Fiber Optic Transceivers and tagged 100G CPAK Transceiver, 100G CXP Transceiver, 100G Optical Transceiver, 100G QSFP28 Transceiver, CFP/CFP2/CFP4 Transceiver. Bookmark the permalink. I am in fact pleased to glance at this web site posts which carries lots of helpful facts, thanks for providing these kinds of information.